Visual, audio, and interactive media are transforming the college classroom. See "Teaching with Video " for a trailer for Kuriyama's class, a video Lue uses, and a video of Kelly teaching. Listen to student podcasts submitted for Kuriyama's class. Now sit in one of Kelly’s lectures in his undergraduate course Literature and the Arts B-51, “First Nights: Five Performance Premieres” (see “First Nights,”  January-February 2000, page 52). This morning in Sanders Theatre, he is describing the 1913 Paris premiere of Igor Stravinsky’s ballet The Rite of Spring. He does not read from books. Instead, Kelly punches up audio recordings of Stravinsky reflecting on the tumultuous performance, and projects color slides of oil paintings and photographs of the composer, plus photographs of the dancers and conductor Pierre Monteux. Next come pictures of the ballet’s score and the original costumes, plus paintings by Nicholas Roerich, the set designer. There’s another audio track of Stravinsky, this time disparaging the work of the choreographer, Vaslav Nijinsky, and a modern video of the opening dance performed by the Joffrey Ballet. Next, as the Rite’s primal rhythms and fierce dissonances thump and cascade through the loudspeakers, Kelly breaks down the piece into its musical units, walking the class through the score with a flashlight pointer. The old-style classroom, grounded in spoken lectures and reading lists, is becoming obsolete. Images now dominate a new style of teaching in which visual, audio, and interactive formats rule, often trumping words as the dominant means of communication. Media enhancements aren’t exactly new: 50 years ago, one of Kelly’s predecessors, G. Wallace “Woody” Woodworth, prepared a 78-rpm record for a Music 1 class by taking a piece of blackboard chalk and marking an “X” on a groove at the entry cue. But new technologies, and a generation reared on them, are propelling the modes of teaching toward nonverbal media and briefer, more compact transactions. Communications—and pedagogy—are moving away from Tolstoy’s thousand-plus pages and toward Twitter, which limits its messages, or “tweets,” to 140 characters. But faculty members are adapting. In Physical Sciences 3, “Electromagnetism, Waves, Imaging, and Information,” lecturer on chemistry and chemical biology Logan McCarty asks, “Why do we see colors on a soap bubble or oil slick?” and projects three examples of this phenomenon onto the screen in a Science Center lecture hall. Next, he draws annotations on a projected diagram of wave-interference patterns while discussing light wavelengths and the Huygens principle. Later, the discussion segues into diffraction, and the screen pulsates with an animation of light waves propagating through a slit. In a lecture on Chinese communism, William Kirby, Chang professor of China studies and Spangler Family professor of business administration, uses color slides to show students how the quality of clothing deteriorated when party leaders switched from Shanghai to Russian tailors. In his course on “Wit and Humor,” Damrosch screens clips of British comedian Eddie Izzard performing his transgressive, quasi-surreal standup act; later, he projects a B. Kliban cartoon of a large hole in the ground, titled, “The Nixon Monument,” and toward the end of the hour, runs a 10-minute film clip called Il Mostro, with Italian actor Roberto Benigni, to illustrate repetition and double entendre in physical comedy. In Kuriyama’s General Education course, “Medicine and the Body in East Asia and in Europe,” students each week make brief (90-second- to two-minute-long) videos, or audio podcasts, instead of writing response papers. They post them on the course website the night before their section meets, view each other’s work, then discuss the videos and podcasts in sections. (The final course project can be a written term paper, a video, a podcast, or a PowerPoint-style presentation; less than 30 percent of the students opt for the traditional term paper.) “The technological revolution that’s happened means that you don’t need expensive equipment,” Kuriyama says. “You can make video clips with a digital camera, or a cell phone, or the webcam on your computer. The things that used to require expertise and specialized equipment are now accessible to everybody. To enrich both teaching and research, the Howard Hughes Medical Institute (HHMI) has supported Lue in directing the development of BioVisions (multimedia.mcb.harvard.edu ), which aims to combine “the highest quality multimedia development with rigorous scientific models of how biological processes occur.” The BioVisions eight-minute film The Inner Life of the Cell has become the most-downloaded science animation in history. It uses sophisticated 3D software developed in Hollywood animation studios like Industrial Light & Magic and Disney’s Pixar to portray complex life processes like polymerization and intracellular signaling in a breathtaking visual display that ushers the viewer right inside the cell walls. “Until recent years, only someone like George Lucas could do things like this,” Lue says. Historian Laurel Thatcher Ulrich agrees. With or without visual elements, “Big lecture courses are not the most effective way to teach,” she declares. “I don’t think passively receiving material does it. You want them to work with actual historical evidence and arrive at conclusions. People learn when they do something.” Accordingly, the 300th Anniversary University Professor uses an elaborate website (www.courses.fas.harvard.edu/~hsb41 ) to define tasks for her students in Historical Study B-41, “Inventing New England.” The site, for example, takes students inside an old farmhouse where they confront an Endicott chair and have to figure out if it really is 200 years old. For her course on the American Revolution, Ulrich posts raw historical data on a website: offering, for example, a town-by-town Massachusetts tax inventory for 1771. “You can look up the percentage of taxpayers who owned sheep in each town in 1771,” she says. “That’s important because they were boycotting British woolens. We’ll ask students this fall: which towns are able to support the boycott? You can link the data to towns that had spinning meetings to promote the boycott.” Posting such data engages students with interactive media, but isn’t necessarily visual; words and numbers still work alongside the new options, albeit in an online format. The information may describe your great-grandfather, but it no longer comes in the hardcover, clothbound book he would recognize. 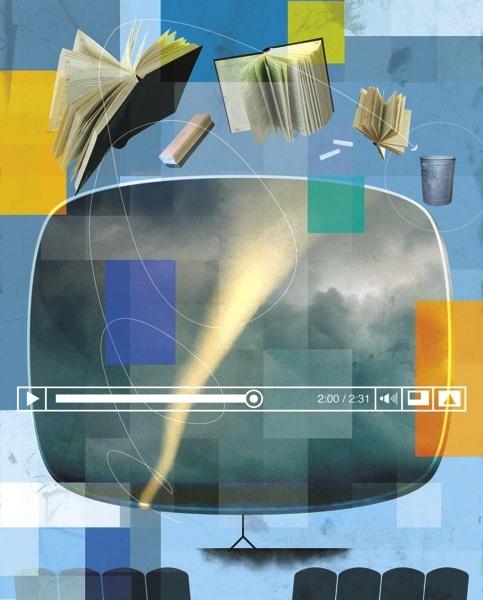 The media revolution means new skills to acquire for faculty members, who are already hard-pressed for time and want to know, say, if the start-up cost of learning a new piece of software will be justified. The 2008 book Born Digital by John Palfrey, Ess librarian and professor of law, and Urs Gasser, executive director of the Berkman Center for Internet and Society at the Law School, describes the generation of young people who have grown up with digital technology. Referencing this work, Alexander Parker, Ed.M. ’96, director of research computing in the humanities, observes that today we often see “students who were born digital, and faculty who were born analog. You sometimes have a situation where students have a greater facility with these tools than the faculty do.” This fall, under the auspices of Diana Sorensen, dean of arts and humanities, Parker is organizing four “tool talks”—“by faculty, for faculty”—on new media at the Barker Center. Indeed, if images and soundtracks are the future of pedagogy, then teaching the young to look must become a high priority. This is yet another area in which technology has outpaced the human capacity to cope with it. People believe—complacently—that they know how to read, but can they really see? Engaging with images in a sophisticated and critical manner is an uncommon skill, even among the younger generation that has grown up with them. Educational institutions have evolved an advanced verbal culture, but sounds and images occupy a far more primitive academic habitat. Librarians deploy powerful tools, for example, for cataloging books and words, but the intellectual technology for classifying images lags far behind. Professors of the future will need not only to expose their classes to pictures, but to teach students how to question them. Perhaps no Harvard professor has taught more students to look thoughtfully at their surroundings than John Stilgoe, Orchard professor in the history of landscape development, who for decades has expertly deployed visual media, especially photographs, in his celebrated courses on the North American built environment and landscape history. He began using slides in his lectures in 1977, when “outside of fine arts, I was the only guy doing it.” Today Stilgoe personally owns 150,000 slides, many of which he made himself with a Rolleiflex square-image camera. Understanding images frequently requires knowledge from outside the frame. A professor at the Fashion Institute of Technology once helped Stilgoe date a photographic portrait simply by observing, “Given that hat, it has to be after 1923.” Scholars who lack such skills can go off on wild-goose chases. A colleague once asked Stilgoe to help her date a photograph; she had worked for a couple of years on an analysis that depended on the date of 1932 inscribed on its back. When Stilgoe observed that there was a 1934 Ford in the background of the picture, the scholar’s art-historical argument instantly collapsed, and she began to cry in Stilgoe’s office. “She thought she had no way of dating the picture by its content,” he explains. Furthermore, academicians sometimes attempt to analyze images that they don’t have the background to understand. Stilgoe once attended a conference presentation that included several black-and-white photographs of Conestoga wagons headed west. Afterward, he asked the presenter if he realized that those images did not date from the 1870s and 1880s, but were pictures taken at twentieth-century centennial celebrations in Midwestern towns, with modern people wearing period costumes. The speaker spurned this view until they projected one of the slides and Stilgoe pointed out a utility pole on the far right of the image. “It’s always been true at Harvard: you have to have a good show,” says Leo Damrosch. He cites Baird professor of history Mark Kishlansky, who once observed that “All of us became better teachers once we got to Harvard,” because the student audience sets such a high standard. Entertainment value is clear in Damrosch’s “Wit and Humor”—and visual elements often are the very material under study. “The way you respond to visual humor is much different from the way you respond to verbal humor, which requires decoding,” Damrosch explains. “In a humor course, it’s essential to move back and forth between the verbal and the visual.” Sometimes a verbal pun can be reborn as a visual one. In his course on the eighteenth-century novel, Damrosch also screens movies. “Most of those novels have been filmed,” he says. “It’s a huge asset to show film clips.” It allows the class, for example, to view the 2005 version of Pride and Prejudice starring Keira Knightley and ask, “Why did they make it more of a Charlotte Brontë romance than the kind of controlled, austere, ironic story you get in Jane Austen’s text?” Damrosch explains. Some faculty members now eschew lectures entirely; they can provide the lecture material as readings or podcasts and gather the class together in a lecture hall purely for discussion. That format doesn’t work for Tom Kelly and the 300 students in his “First Nights” course. “I put on a show,” Kelly says. “I play the piano, I cue up CDs and pictures and slides, I mark up scores on the overhead projector in real time with red and blue markers. I once had a staff person volunteer to put all the slides and music on one DVD—I could just push buttons! But that completely misses the point. If I don’t have to run across the stage to play the piano, and trip over the cord on my way to the overheads, and bump into a table when I’m running to the computer, half the production values are lost!